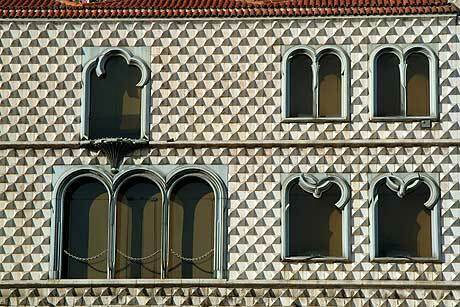 Casa dos Bicos (literally, the House of Spikes, from the pointy diamond-shaped stones which cover its facade) is a unique architectural gem in Lisbon. Located in the Alfama district, the house has been drawing visitors’ attention since the early 16th century, when it was built by order of Bras de Albuquerque (son of Afonso de Albuquerque), presumably after the model of the Italian Palazzo dei Diamanti he must have seen and admired during his stay and travels in Italy. Architecturally speaking, the edifice strikes by the fact its facade is covered with diamond-shaped stones (over 1,000 stones of this kind) while also combining Manueline features (the windows and the portals). If compared with other historical edifices in Lisbon, Casa dos Bicos has managed to survive the 1755 earthquake in good condition. Most of the facade, as well as the two upper floors were affected, but after 1980, when the house became the property of the municipality of Lisbon, it was restored closely following the original design (pictures and drawings dating back to earlier than the 1755 earthquake). The house is not open to the public on a daily basis, though sundry exhibitions are occasionally held here, giving tourists the opportunity to study the edifice from the inside.